Explain: "Frankenstein itself acquires an anti-formal monstrosity, an uncontrollable, irrational excess of signification that transcends the boundaries of normal, comprehensible discourse" (468). In what ways, according to Brantlinger, does Shelley's 1831 Introduction to Frankenstein parallel the main story? How, according to Brantlinger, is miseducation portrayed in the novel? How, according to Brantlinger, does Shelley suggest "a continuity between medieval alchemy and modern chemistry" (470)? 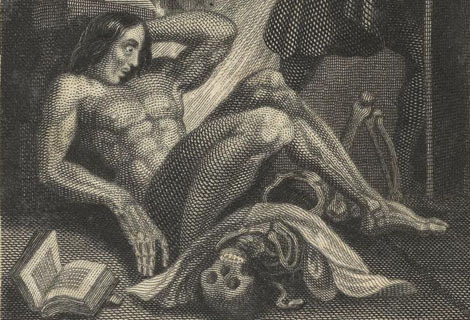 In what ways, according to Brantlinger, is reading in Frankenstein "represented as dangerous activity, leading to insanity" (471)? Explain Lacan's concept of the mirror stage. Explain: "[T]he monster is in some sense the author of the murderous text in which he is also one of the dual protagonists" (472). Explain: "[I]n Gothic texts more generally, the critique of Enlightenment rationality involves a critique of the very motives for reading and writing" (473). Explain: "[T]he novel itself seems to be, or to acknowledge being, a collective creation" (473). Explain: "That the Monster, though if anything more eloquent and rational than Victor, speaks only through the ventriloquism of Victor (and Walton) encourages both his identification with his creator and the erasure of his demoniac literacy, which is also his ability to represent himself" (475).